A very warm welcome to you. We are beginning to think that this should be renamed ‘Old And Rusty’ as apart from the dull regulatory stuff most of what goes here is down to the hands on bit of the business, the repair and maintenance of stuff! This news edition is pretty packed with, well, news including the Black Horse is open again and very fine it is too, Lindsay Muir is now the European Ladies Champion and Andrew Holly won the UK Nationals. The CAA have been busy again with some dates for the 2013 CPL exams being announced. On the article side Steve Roake has done us proud with his take on the Grassroots Meet and there is an update on Trevor’s Viva coming soon. Out between news issues was an article on Pobjoy, a hero of hours. The usual, and unusual, crop of visitors have called by over the past week or so including Messrs Malcolm (Bear) Campbell who arrived at the same time as Robin (Birdman) Batchelor. 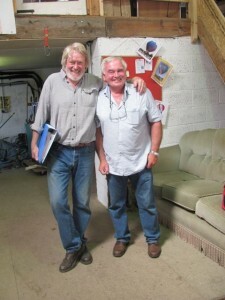 Two old ballooning stalwarts in one place meant within moments “there was this telegraph pole at the end of the showground carpark” was up against “there was this hornet’s nest”. Anyway it was most entertaining. John has now flown off to somewhere hot for his hols whilst we look forward to a predominantly wet and windy week here in the Chilterns. On the ups the odd break in the weather saw us finally test-fly Blue Peter G-BXXL, something we have been promising to do for a couple of years now. Bit porous in the descent but managed a litre a minute so not too bad. More on that later. So a most warm welcome to you if this is your first visit and welcome back if you’ve wandered around the site before. Essentially Easy Balloons Ltd is a Part M Subpart F & G Organisation run by Jane and assisted by Alice looking after continued airworthiness matters and supporting, amongst others, Wendover Trailers and the Balloon Repair Station with whom they share premises. Here you will find not so much ballooning stuff but the stuff enjoyed by balloonists. Thanks for visiting we hope you find the site fun and helpful.